Darris Love was shopping at a Los Angeles-area mall when he was arrested at gunpoint. Now he's planning a civil rights lawsuit. 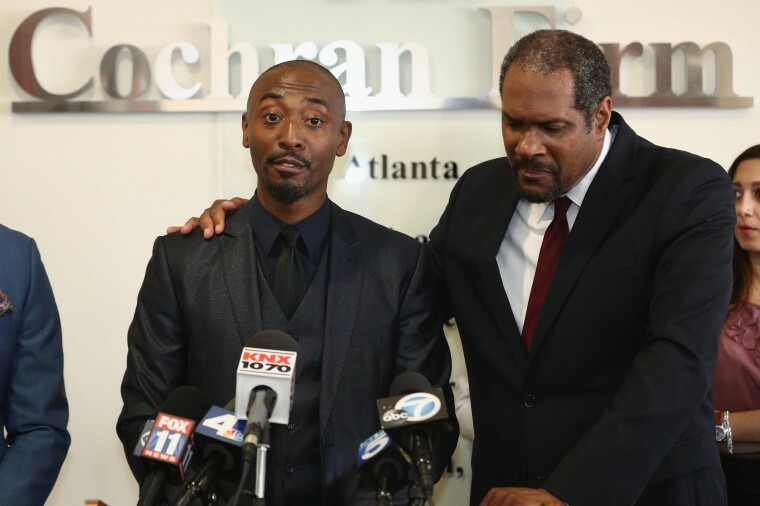 LOS ANGELES — An African-American actor says he was racially profiled and wrongfully arrested last week as a suspect in a burglary ring whose members led sheriff's deputies on a freeway pursuit that was broadcast on television. Darris Love, 38, along with his girlfriend, Ayesha Dumas, 39, who is also black, said they plan to file a claim with the Los Angeles County Sheriff's Department within a week as a likely prelude to a civil lawsuit. Love's lawyer said his client was held for hours despite evidence that he had been many miles from the crime scene. Love said he and Dumas were at a suburban Los Angeles mall Wednesday when the arrest took place. "We were just shopping, just doing what normal people do in the mall," Love said at a news conference Tuesday. He was accompanied by one of the national founders of Black Lives Matter, Melina Abdullah. He said he was terrified when deputies, with their weapons drawn, surrounded him and barked orders. "If you do anything wrong — breathe wrong, look wrong — you could be dead," he said. The two were detained after a suspected burglary crew in a black BMW sedan led deputies on a chase from suburban Tarzana to the Glendale Galleria mall, about 20 miles away. Love was running to the Apple store at the adjacent Americana at Brand mall shortly before noon to get a parking validation, the two said, when he was spotted by officers and arrested at gunpoint. "Slammed to the ground, knee on your neck," said the actor, whose credits include "Straight Outta Compton," "ER" and "CSI: Crime Scene Investigation." In a statement, the sheriff's department said an officer saw Love running near the area where the car chase had ended, and detectives initially identified him as one of the men seen leaving the house in Tarzana that had been burglarized. Love "closely resembled" the burglar, the statement said. Dumas said officers at the mall, unaware that she was with Love, zeroed in on her vehicle as she waited for him to return with the parking validation. She said she was "held at gunpoint with a K-9 dog barking at me to get out of my car." The actor said he pleaded with his jailers, asking them to look at Americana security video and at his parking stub. They released him after seven hours, his attorney, James Bryant, said in an interview. Police failed to do "any number of things they could have done to quickly resolve this issue to determine he was not a suspect," Bryant said. Bryant said his clients were still considering the role of Glendale police, one of three departments involved in the hunt for the burglary suspects. "We feel [Love] was just randomly picked out and racially profiled by Glendale police," the attorney said. Love said he's starting a social media campaign, #IAmNotASuspect.